Will Obama keep Yemeni journalist in jail? Yemeni journalist Abdul-Elah Haidar Shaye, imprisoned in Sana’a since August 2010, is set to be released “soon”, according to a new presidential order. But this is not the first time a Yemeni president has pledged to set him free. Shaye, sentenced in January 2011 to five years in prison for allegedly being a “media man for al-Qaeda’, should have walked free a month later. Weeks after his sentence was handed down in the Special Criminal Court for Security Affairs, then-President Ali Abdullah Saleh issued a pardon for his release. But a day later Washington stepped in. In a phone call between Barack Obama and his Yemeni counterpart, the US president “expressed concern” over Shaye’s impending release. The presidential pardon was never carried out. Shaye has remained in the capital’s notorious Political Security prison ever since. On Tuesday night the office of Saleh’s sucessor, President Hadi confirmed that “there is an order from the president to release him [Shaye] soon”, without elaborating on when this is likely to happen. Shaye’s family remain sceptical about the order that was given about a week ago. “We’ve heard nothing of the sort and it’s like the same as previous promises. So far this is the fourth time Hadi has made this promise,” said Shaye’s brother, Khaled. During his trial — at which the journalist turned down legal representation as he refused acknowledge the legitimacy of the court — Shaye indicated the real reason behind his detention was his reporting on US strikes and specifically the deaths of civilians including 14 women and 21 children killed in a sea-launched cruise missile strike on the village of al-Majala in December 2009. Despite the Yemeni government claiming they were responsible for destroying an “al-Qaeda training camp” Shaye blamed the killings on America after visiting the village in the province of Abyan and finding US made bomb remnants. Seven months after the al-Majala bombing and following his criticism of both the Yemeni and US Governments, Shaye was abducted by Political Security Organisation [PSO] gunmen. Beaten and threatened before being released, in response Shaye went back on television. A month later, in August 2010, his house was raided by Yemen’s elite US-trained and funded Counter Terrorism troops. Shaye was once again beaten and tortured, according to the Yemeni human rights organisation HOOD, during 34 days in solitary confinement with no access to a lawyer or family members. In an October 2010 court hearing, after more than two hours of the prosecution presenting its case, Shaye was allowed just a few minutes to respond. In those moments he suggested what he believes is the real motive behind his incarceration. “When they hid murderers of children and women in Abyan, when I revealed the locations…it was on that day they decided to arrest me,” he shouted from behind the bars of cell alongside the courtroom. Leaked diplomatic cables released shortly after after the conclusion of his trial confirmed Sahye’s accusations that the US had indeed carried out the al-Majala bombing. In an interview last year with the US Ambassador to Sana’a, Gerald Feierstein reiterated to me America’s interest in his case. “Haidar Shaye is in jail because he was facilitating al-Qaeda and its planning for attacks on Americans and therefore we have a very direct interest in his case and his imprisonment,” he said. No evidence has ever been produced by either the US or Yemeni Government to support the claim that Shaye was facilitating any such attacks. Since Shaye’s imprisonment in 2010 the US resumed its drone strike programme in Yemen during 2011, following a year-long break. Last year the number of strikes reached an all-time high, surpassing the number carried in Pakistan for the first time, according to monitoring groups. In February last year Shaye went on hunger strike, but was persuaded by his family to halt the protest at his continued detention when his health rapidly deteriorated. Human rights and press freedom organisations have continued to demand his release. 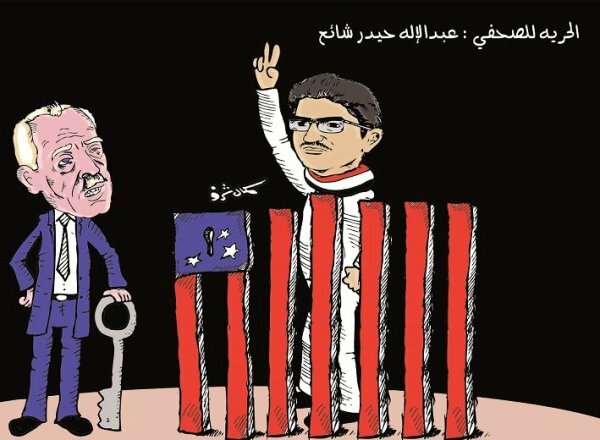 On World Press Freedom Day last week the International Federation of Journalists [IFJ] reiterated its call for an end to his incarceration in a letter to the Yemeni president. In a meeting with IFJ president Jim Boumelha last year Hadi had promised to do “everything in his power” to free Shaye. It’s unclear if this most recent order will be carried out, or if Washington will once again seek to keep Shaye behind bars. The US Embassy in Sana’a failed to respond to requests for comment on the presidential release order.